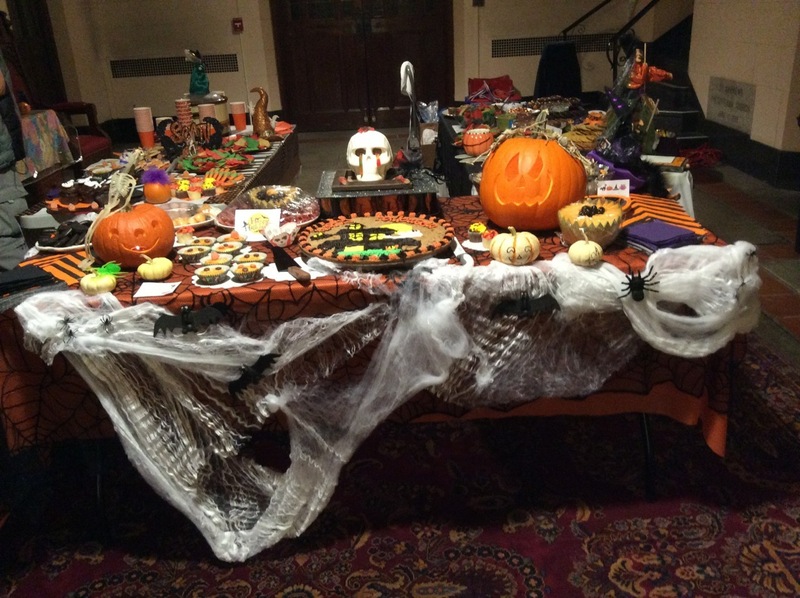 2016 RCCO Halloween Concert, a huge success! 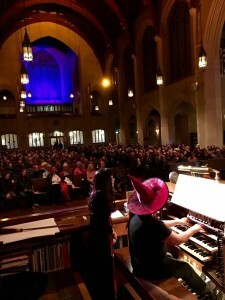 Once again, St. Andrew’s-Wesley United Church (the largest Gothic-style church in Vancouver) was filled with skulls, skeletons, and spiders, a giant inflatable ghost, lights and a projector, and performers in costume started double-checking their registrations (the pistons were slightly haunted). In the half hour leading up to the concert, we ran out of programs twice (running off to print more each time), and shortly after it began, we ran out a third time. 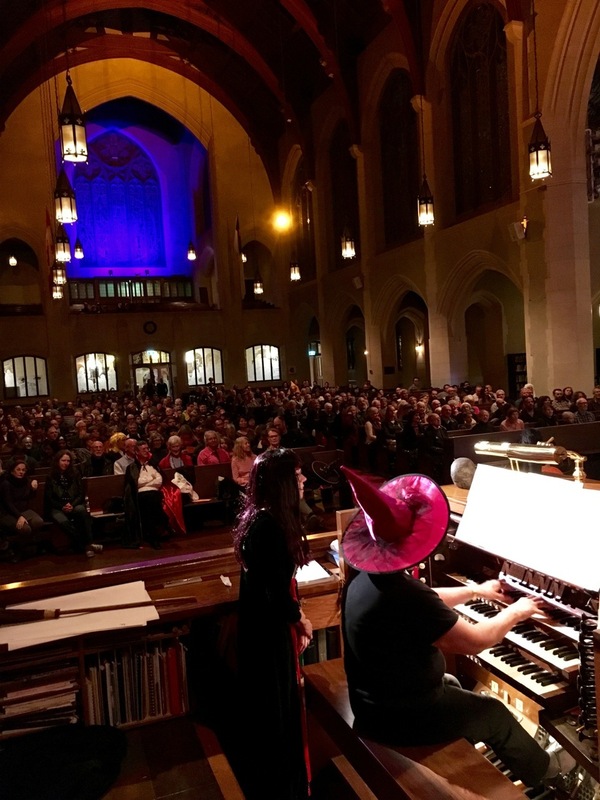 We had far more people than usual (at least 340) and an interview with some of the performers, which was broadcast on CBC Radio One’s Early Edition that morning, was likely the main reason for the unexpectedly high turn-out. Tamar Genossar began with Bach’s famous Toccata and Fugue in D Minor, followed by Aquarium from Saint-Saëns’ Carnival (performed by new member Michael Park). Then Denis Bédard and Rachel Alflatt filled the building with a movement from Merkel’s grand Sonata for Organ Duet. Our Regional Director and MC Sam Balden was bringing laughter from the audience in between each performer, with interesting stories and jokes about Halloween. The evening continued with Susan Ohannesian doing a haunting Dubois Cortege and the Gigout Toccata. Sam followed this with a dark excerpt from a Requiem and the Funeral March for a Marionette (by Gounod). After this, Michael Dirk (who was also operating the camera) presented Langlais’ Épilogue for Pedal Solo, from the Homage to Frescobaldi, showing people a close-up of the Gleason pedal technique. Haruyo Shikano Abramson next did an arrangement of the Phantom of the Opera. 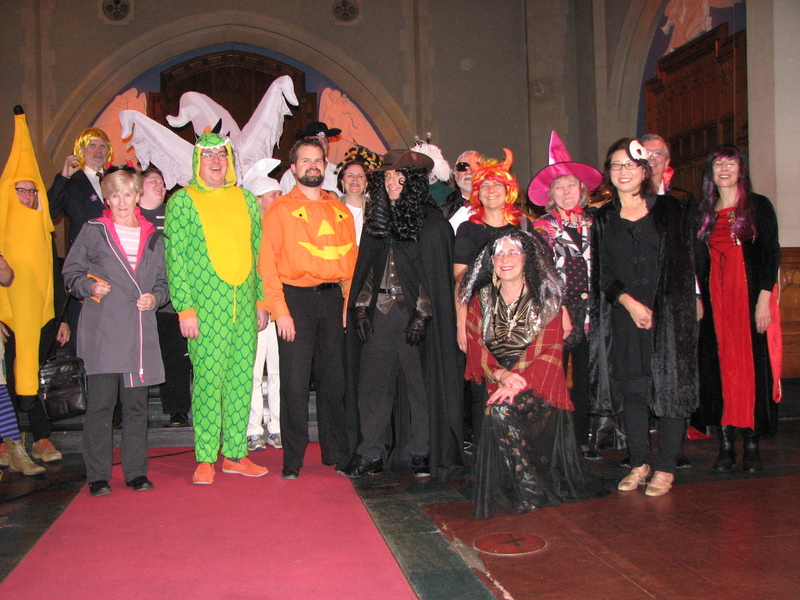 Local president Michael Molnar then offered an arrangement of the Death of Ase (from Grieg’s Peer Gynt) and the spooky Waltz from Rawsthorne’s Dance Suite. The concert concluded with Gail Ovington (who flew in from Kamloops) performing the Boellmann Toccata (from the Suite Gothique). The reception afterwards was filled with all kinds of goodies, very well put together by a team of helpers led by Cindy Leung (with extra treats bought during the concert by Dani Genossar, due to the size of the audience), and the narthex was packed with concert-goers. Many thanks to St. Andrew’s Wesley United Church, Darryl Nixon, the CBC Early Edition, and all those who organized, performed and helped in any way with this event. It was a huge success and we are already looking forward to next year!